Here's a story that you probably haven't heard. It's one of those that will appear for a 24-36 hour news cycle and be gone. But The Blaze did it justice and featured it on its news site. And I figured we could all use a good, positive story. Anthony “Joe the Barber” Cymerys has been a fixture every Wednesday for years at Bushnell Park, in Hartford, CT, where he cuts hair and his friends hand out food to the needy. But shortly after Cymerys set up shop this week, he said, health officials and police confronted him and his friends and told them they had to leave because they didn’t have permits. But here are the details that add to this story: Anthony is 82-years-old and has been giving his free haircuts for 25 years! In fact, it was just a year ago that the City honored him for his humanitarian work and he was presented a citation by the Mayor's office. But unnamed local residents expressed concerns about the “safety and sanitation” of Cymerys’ free haircuts to homeless people and his friends’ food distribution. They also noted that Cymerys is not a licensed barber. That's all it took for City health officials to run him out of the park. Of course, I'm sure these "well-meaning" citizens had no intention of paying themselves so that the homeless could get a haircut or a hot meal. But for once, there is a happy ending to the heavy-handedness of over-reaching government officials. Mayor Pedro Segarra granted Cymerys a special dispensation in light of his years of charitable work. What's more, the city will help Cymerys obtain a state barber’s license if he likes. Anthony learned how to cut hair while he was growing up, and although he isn't a certified barber, he says he always takes health precautions including soaking his trimmers in alcohol. 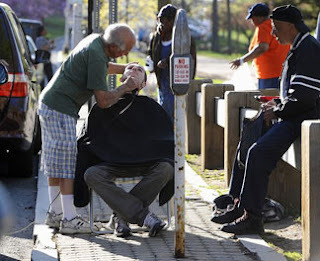 “Twenty-five years I’ve been giving haircuts, and no one died on me.” He began giving free haircuts to the homeless in the city around 1988, when he was volunteering at a shelter. He said he met a heroin addict named Arnold who needed a haircut, so he offered his services. “I said, ‘Geez, Arnold. Not only are you a bum, you look like a bum. How about I bring in my clippers?’” Cymerys recalled. A retired businessman, Anthony said his father cut his hair as a child, and he took it up. “It’s all about inspiring people to do things for the least of our brothers,” he said. And that is one of the hallmarks of this country's legacy .... Inspiring each other to help those in need. It happens far more often than is reported. Individuals helping individuals out of the goodness of their hearts and from their own storehouses of wealth; no matter how large or small their bank accounts. Anthony saw a need and filled it. 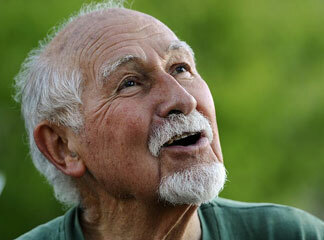 He didn't wait for a government agency to take it from one person to give to another. He lives out the one commandment that our Lord urged above all others, Love your neighbor as yourself. Well done, Anthony! Your citation from the city of Hartford is nothing compared to your rewards in Heaven! 1 Timothy 1:5 "The aim of our charge is love that issues from a pure heart and a good conscience and a sincere faith."